Dahntay Jones and Wes Wilcox discuss Isaiah Thomas' return to Boston. Klay Thompson goes off for 39 points, including 9-11 from three-point range as the Warriors take care of the Nuggets at home. NBA TV analyst discuss why the Nuggets are are playing well and should have a good playoff seed spot. Isaiah Thomas checks in with GameTime after appearing in his first NBA game since March 2018. 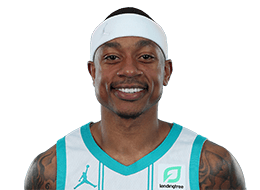 Matt Winer and Sekou Smith discuss what they expect to see as Isaiah Thomas is set to make his Nuggets season debut against the Kings. LeBron James notches his first triple-double of the season with 28 points, 11 assists and 11 rebounds to lead the Lakers in a come-back win over the Nuggets, 121-114. Anthony Davis scores a game-high 33 points as the Pelicans get the win over the Lakers, 128-125. 2012-13: Averaged 13.9 ppg (.440 FG%, .358 3pt%, .882 FT%), 2.0 rpg, 4.0 apg, and 26.9 mpg in 79 games (started 62) ... NWT-personal reasons in one game ... DNP-CD in two games ... Ranked 7th in NBA in free throw percentage ... Scored in double-figures in 56 games, 20 or more in 21, 30 or more in three ... Dished out 10 or more assists in two games ... Recorded two double-doubles (4/14, 4/17) ... Led Kings in scoring in 18 games and assists in 33 ... Had consecutive free throw streak of 46. Top Single-Game Performances: Recorded fourth career double-double and first of the season with 10 points (2-9 FG, 1-3 3pt, 5-5 FT) and season-high 10 assists to go along with one rebound in 28 minutes at Houston (4/14) ... Made a career-high seven three-pointers en route to a game-high 31 points (10-18 FG, 7-12 3pt, 4-6 FT), three rebounds, seven assists, and one steal in 35 minutes in a win at Golden State (3/27) ... Hit game-winning shot with 1.9 seconds left to finish with 22 points in 96-94 win at Washington (1/28) ... Recorded 27 points (10-15 FG, 3-7 3pt, 4-5 FT), four rebounds, five assists, and one steal in 40 minutes in a win vs. Boston (12/30) ... Tallied a career-high 34 points (13-22 FG, 6-8 3pt, 2-3 FT), two rebounds, five assists, and one steal in 33 minutes vs. Miami (1/12) ... Recorded 30 points (9-18 FG, 4-6 3pt, 8-9 FT), six rebounds, and nine assists in 37 minutes at Atlanta (2/22). 2011-12: Averaged 11.5 ppg (.448 FG%, .379 3pt%, .832 FT%), 2.6 rpg, 4.1 apg, and 25.5 mpg in 65 games (started 37) ... As a starter, averaging 14.8 ppg (.477 FG%, .406 3pt%, .841 FT%), 3.1 rpg, 5.4 apg, 1.0 spg, and 32 mpg in 37 games ... Scored in double-figures in 39 games, 20 or more in eight ... Dished out 10 or more assists in three games ... Recorded three double-doubles ... Led team in scoring in six games, assists in 26 games ... Twice named Western Conference Rookie of the Month (February and March 2012), joining Tyreke Evans (October/ November and December 2009) as the only Kings rookies to receive the award in consecutive months ... Only fourth Kings rookie to be awarded monthly honor, joining Evans, Lionel Simmons, and Brian Grant ... Led Western Conference rookies in March in assists (4.9 apg) and was second in scoring (13.6 ppg) ... In March, led all rookies in fastbreak points (64) and free throws made (54), and was second in assists (89), third in points (245) and steals (24) ... In February, led Western Conference rookies in scoring (12.2 ppg) and was second in assists (4.4 apg) ... In first five starts, scored 96 points, tying him with Otis Birdsong (Nov./Dec. 1977) for the most points scored in the first five starts as a Kings rookie since games started was first noted on official box scores in 1970-71 ... In first four starts, also matched Birdsong with 78 points. Top-Single Game Performances: Recorded a game-high and career-high 28 points (11-19 FG, 3-9 3pt, 3-3 FT), 10 assists, four rebounds, and one steal in 41 minutes vs. San Antonio (3/28/12) ... Tallied 24 points at Miami (2/21/12) with 20 points (5-6 FG, 5-6 3pt, 5-5 FT) coming in the third quarter, the most points a Kings rookie scored in a quarter since the 2000-01 season ... His five 3-pointers tied Jason Williams (4/23/99 vs. Minnesota) for the Kings franchise record for most 3-pointers made in a quarter. Selected by Sacramento as a junior out of Washington with the 60th overall pick in the 2011 NBA Draft ... Signed a multi-year contract with Sacramento (12/9/11).... Traded from Sacramento to Phoenix in exchange for the rights to Alex Oriakhi on July 12, 2014. Thomas finished his three-year career at Washington ranking sixth in school history with 1,721 points, third with 415 assists and eighth with 122 steals ... Averaged 16.4 ppg (.426 FG%, .325 3pt%, .713 FT%), 3.5 rpg, 4.0 apg, 1.2 spg, and 30.4 mpg in 105 games for the Huskies ... Named First Team All-Pac 10 as a junior, ranking first on team in scoring (16.8 ppg), assists (6.1 apg), and steals (1.3 spg) ... Scored in double figures in 32 of 35 games played ... Scored a season-high 28 points (10-16 FG) against Arizona ... Dished out a career-high 13 assists along with 27 points against California ... Recorded 21 points against Washington State with 11 assists ... Notched 24 points along with eight rebounds against Nevada ... As a sophomore, ranked first on team in assists (3.2 apg), second in scoring (16.9 ppg), and third in steals (1.1 spg) ... Scored in double figures in 31 of 35 games played, including 11 games with 20 points or more ... Tallied a career-high 30 points in the season opener against Wright State ... Named Pac-10 Freshman of the Year and led team in scoring (15.5 ppg) and assists (2.6 apg), while ranking third in steals (1.1 spg). PERSONAL: Full name is Isaiah Jamar Thomas … Age 24 … Son of James Thomas and Tina Baldtrip … Named after the former Indiana and NBA all-star guard Isiah Thomas when his father, James, lost a friendly wager on a Lakers vs. Pistons playoff game in 1989 ... Earned degree in American ethnic studies from Washington in July 2012 ... Twitter: @isaiah_thomas2.